The user management tool allows you to add additional administration users to LimeSurvey. We will call them in this chapter just 'users'. Do not confuse them with [[Survey participants|survey participants]] (respondents). The user management tool allows you to add additional administration users to LimeSurvey. We will just call them 'users' in this chapter. Do not confuse them with [[Survey participants|survey participants]] (respondents). ** LimeSurvey sends out a confirmation email to the address entered into the '''Email''' field. This email address will be used as the standard contact email address for surveys created by the respective user. 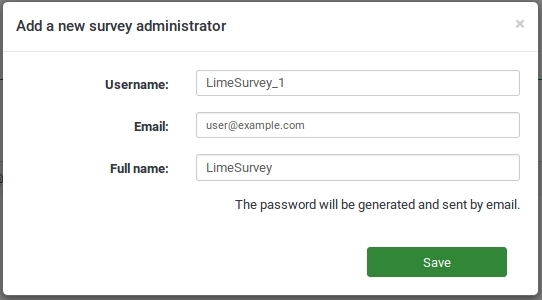 ** If you don't want the user to receive the confirmation email with a link to the LimeSurvey application, username, and password, you can use your own email address to send the confirmation email to you. After that, you can change the email address to the address of the user. * Enter user's full name into the '''Full name''' text field. Please note that the full name entered here will be used as the standard contact person name for surveys created by the respective user. * Click '''Save''' to create the new user. You have now created your first user. To find out more about [[Manage users#Set global permissions for a user|setting user permissions]], please read on. To get a proper understanding of this function, check [[Manage users#Examples|the examples provided below]].